May 26th, 2018 – On a bright and sunny 91 degree day at Gillette Stadium in Foxboro, Massachusetts, two teams with similar pasts faced off. Both struggled for years to get to championship weekend, but now they had finally made it and were determined to make the most of it. 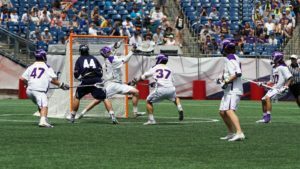 The Yale Bulldogs and Albany Great Danes took to the field to battle. Yale’s John Daniggelis started the game off with a bang, scoring the first goal only one and half minutes into the game, three minutes later a stunned crowd of 30,000 saw the Bulldogs up 4-0 and Albany’s all-american goalie JD Colarusso struggled. Four minutes later more of the same came as Yale struck 3 more times extending their lead to 7-0 with goals from Jackson Morrill, Ben Reeves, and Matt Gaudet. By the end of the first the Bulldogs were on top of the Great Danes in all major categories. Albany finally got on the board with a goal from Jr Sean Eccles. Albany was able to battle back to 9-5, but just when a largely Albany crowd thought that the Dane train was back to make any impact. It was not to be, the Bulldogs grabbed the next three goals, including the goal of weekend when superstar Ben Reeves passed the ball from the X with 2 seconds left to Jackson Morrill for a last second goal that put Yale up 12-5 at the half. 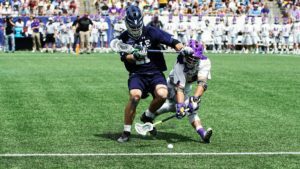 Albany struck quickly with two goals out of the gate, but just when the Dane train was looking like it might be back, Yale roared back with four straight goals to go up ten on the Danes 17-7. At this point the masses knew it was over, whether it was super faceoff specialist TD Ierlan who was not able to control the X, or only one point from superstar freshman Tehoka Nantlcoke, it just wasn’t the Danes day as a long game ended for Albany finally came to an end, the final 20-11 Yale. After the game it was two different outlooks for two historically similar programs. 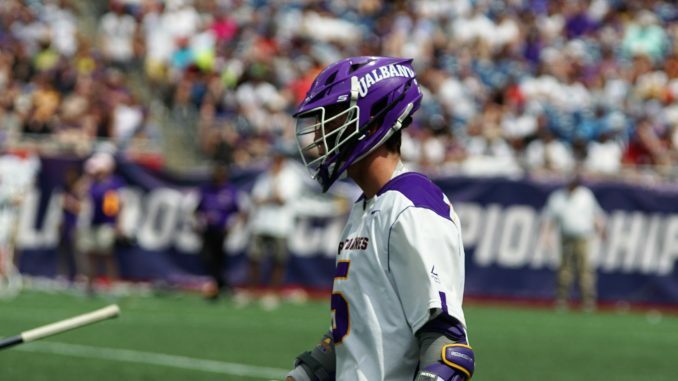 Albany was forced to look back at a historic run in the past tense, for Yale the run isn’t quite over. The loss, while sad for Albany at the moment, may soon become the start of a Maryland like run now that they are over the hump. Albany coach Scott Marr said it best “Again, they took our program to another level. We said it earlier, Connor said the Thompsons are the ones who really got us to this point, and this group now has taken us to the next level, so I appreciate all their efforts.” Albany has a lot to look forward to, and will for certain be back soon with so much young elite talent. Yale coach Andy Shay spoke of Albany “You know, we squarely consider [Albany] probably our biggest rival out of league, and we have a ton of respect for how they play. We like to play like they play, and it was just a hard-fought game. They should hang their hat on a phenomenal season, and we know we beat an incredible opponent. Very proud of my guys for sticking to the details and grinding as much as teams it has been a great year and that both coaches were able to acknowledge that today is a great thing. We have two big takeaways from the first matchup today, Yale can be more than Ben Reeves, and, the Dane train was finally stopeable. Yale moves on to their first ever National Championship game Monday when they face Duke.